Over the last few years vertical climbing machines have become ever increasingly popular. This is mainly due to the fact that they are an excellent way to give yourself a full body workout. Furthermore they take up very little room. Due to their small footprint, they are the perfect addition to a home gym. In this guide to the best vertical climbing machines we will be showcasing the top 5 vertical climbers on the UK market. As usual all the models featured are best sellers and come with very good customer feedback. 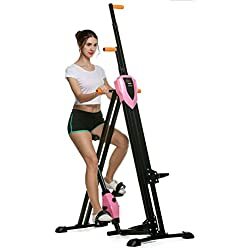 When searching for a full body workout that includes aerobic training that is more effective than running or cycling, a climbing machine is the number 1 choice for many people. The Maxi Climber is the model that many of these people go on to buy. With four and a half stars on Amazon the feedback looks positive. So, let’s take a look at why this climbing machine is so popular and the reasons it is the best climber machine UK residents can purchase. 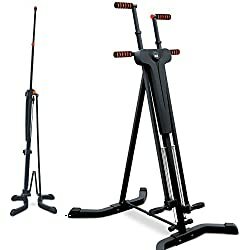 When first opening this piece of home fitness equipment aside from the vertical climbers there is a few freebies chucked in. These include the Maxidiet and exercise plan as well as a diet and exercise wall chart. 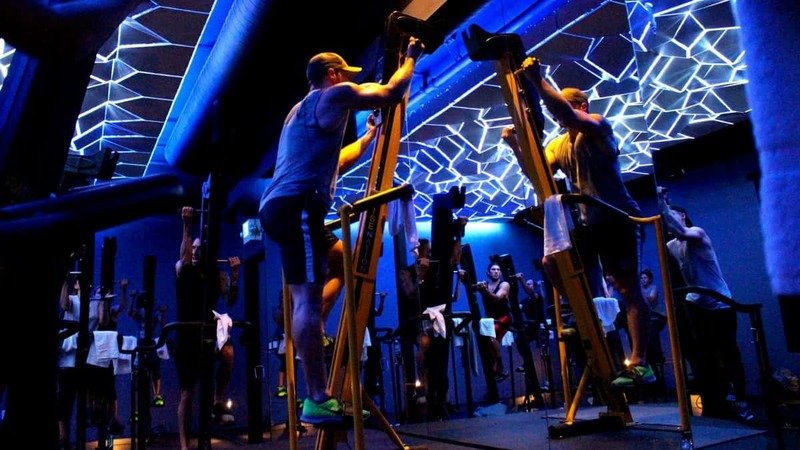 Two helpful tools in the fight for fitness. The climber itself is solid in design been constructed from high-quality durable steel. There is a maximum user weight of 110kg which is roughly just over 17 stone. For anyone worried about the durability of this type of fitness product there is a 3 year warranty with model, which should alleviate those doubts. Features include five different height settings, those on the tall side will be glad to know this machine is suitable up to a height of six-foot and five inches. The digital monitor shows the users step count and calories burned. 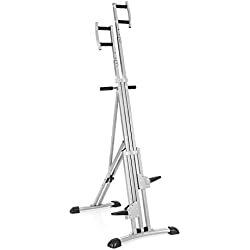 To sum up: for a very affordable price anyone who buys this vertical climber will get themselves a very sturdy, durable and high quality model. With excellent reviews and overall positive feedback this is the best climbing machine UK customers can buy. Furthermore it costs a lot less than some of the models featured in our top list. Sportstech are a fairly new brand in the UK, however, this german brand has quickly gained a reputation for their high-quality home gym equipment and exercise machines. 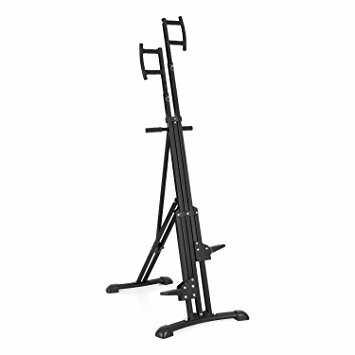 The Sportstech Vertical Exercise Climber is a highly functional and very practical model, due mainly to its folding design. The folding mechanism means it can be folded up with ease and the overall footprint is very small making it ideal for those with limited space. 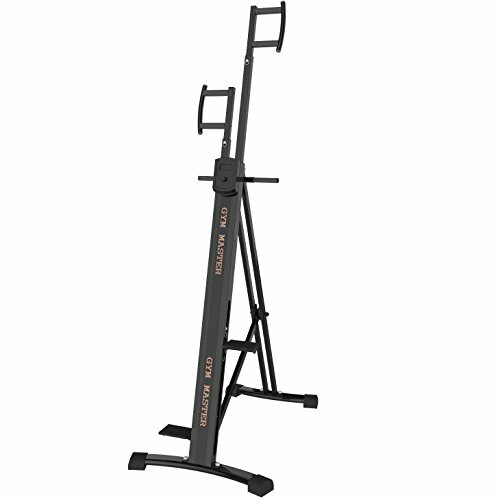 Due to this been a new product to hit the UK customer reviews are limited , however, all of the Sportstech brand home gym equipment that we have reviewed so far tends to be of the best quality. This climbing exercise machine of theirs seems to be of the same quality. It comes with a very solid and robust look and with a maximum user weight of 120 Kg it is suitable for most people. Other features include an LCD that comes with a step counter, chronometer and calories burned functions for keeping track of training results. Finally there are 5 heights adjustments with the highest setting been suitable for those up to 6 foot 4 inches. To sum up: like all Sportstech fitness equipment this climbing machine is top quality. It comes with a solid design and if customer reviews are to be believed, it is very sturdy in use. 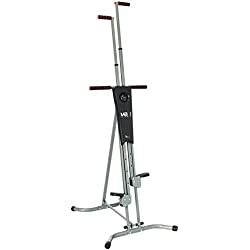 If you are looking for one of the best vertical gym machines for home use this one comes highly recommended. The second model in our list of the best vertical climbers UK customers can buy is made by Homcom, a brand well-known for their affordable home fitness equipment. 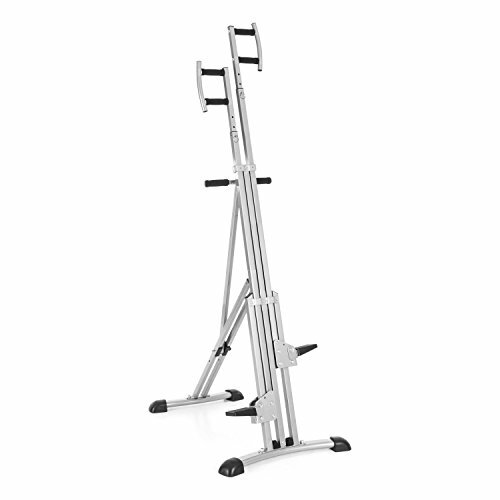 The most noticeable thing about this climbing machine is that it is a 2 in 1 version. In addition to the climbing capabilities there is also an exercise bike option which is great for a varied workout. Features include a large LCD screen which tracks the users time, speed, distance and calories. The seat is adjustable up to five levels and is thickly padded for extra comfort. Made from a thick tubular steel the sturdiness and durability is not an issue unlike with some budget models. Especially relevant is this is a foldable vertical climber with a small footprint making it good for those with limited space. To sum up: for the price this piece of home gym equipment can’t be knocked. 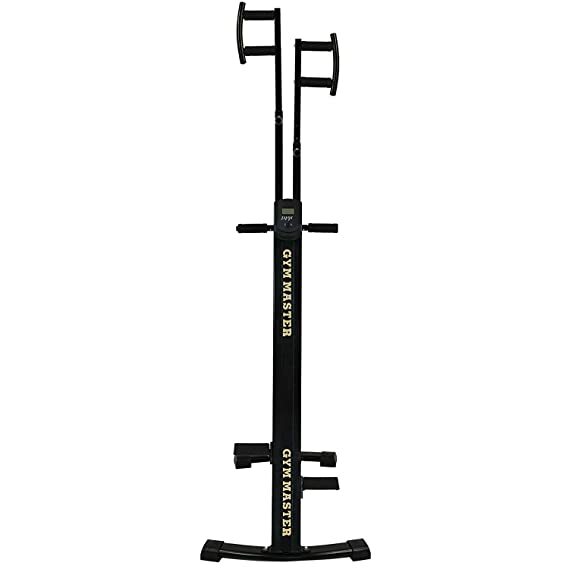 Due to its affordability and versatility it comes highly recommended as a well-built 2 in 1 vertical climbing machine. This is without any doubt one of the most sturdy and solidly built home vertical climbers on the UK market. Made from extra thick tubular steel and with a maximum user weight of 150kg, this is a very durable model which is well suited for regular use. The on board digital counter shows the same readouts as other budget models. These include, speed, time, calories burned and distance. These four readouts are all that is really needed to set fitness goals and keep track of any improvements. As mentioned this is a solidly designed vertical climber. Where as many budget models use cheap plastic pedals the Gym Master uses a heavy-duty metal design. To sum up: the Gym Master is best suited for those that workout hard. The design is robust and perfect for the heavier person. 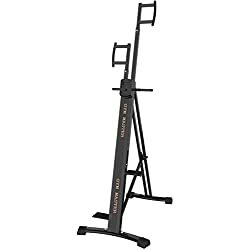 Very affordable and receiving good reviews on Amazon this is a very good but for a home gym. 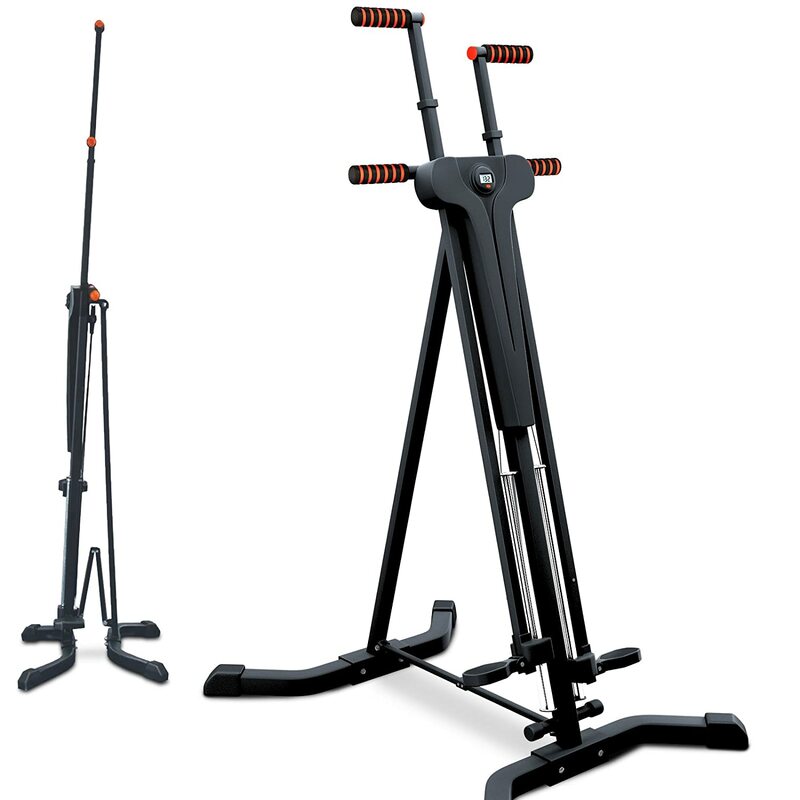 Here we have another 2 in 1 climber and exercise bike this time by the Ancheer brand. With an impressive four and a half stars rating on Amazon and some very good reviews this model comes with good recommendations. 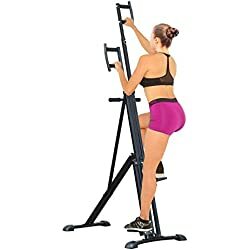 The first thing to say about this fitness climber is that the overall design is solid and very sturdy. This is a mid priced range model and with that extra cost comes a high quality product than some cheaper fitness climbers. The LCD screen tracks four readouts including the users step count, time speed and distance, calories. Overall these readouts are more than adequate to track any progress when setting fitness goals. Especially relevant with this been a piece of home gym equipment is how quiet it is. The Ancheer Unisex Vertical Climber is specifically designed to run smoothly and quiet. Another positive is the small footprint of this climber machine. With it been a folding design this is a good space-saving model, ideal for those with limited space for a home gym. To sum up: with the added bonus of a built-in exercise bike this is a great value for money climbing machine. Built to a high standard and with multiple colour options this is one of the best 2 in 1 climbers for a home gym. There is no denying this is a well built model and sturdy when in use. As with most climbers it is adjustable for multiple users. 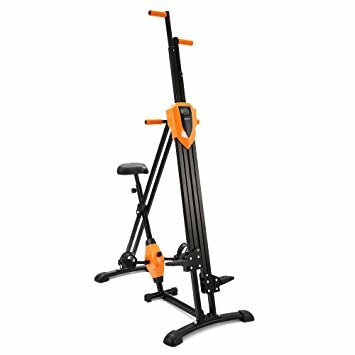 It is also a foldable climber with a small footprint which as mentioned earlier makes this type of exercise machine ideal for home use. The most noticeable thing about the Capital Sports climber is that there is no monitor. Due to this when compared to other vertical climbers I would say this one doesn’t give good value for money in the slightest. One positive is that there are two colours to choose from which are black and grey. However, even though both colours are the same climbing machine the black one, for some strange reason costs more. To sum up: despite what we have said about this model by Capital Sports it is a very sturdy and robust climber. 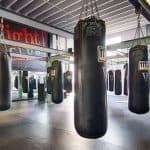 But with Fitness Fighters aiming to bring the best value for money fitness equipment to our readers we would steer clear of this one. To prove our point, a buyer could get two Maxi Climbers for the price of one of these. Before buying a climbing machine for home use there are a few things to consider first, especially if you are to get the model best suited for your needs. Below is a list of the most important factors to consider before buying. The LCD screen allows the user to track progression with the aid of its functions. Generally speaking the more expensive a climbing machine is the more functions it will tend to give. As a rule of thumb a machine that shows time, speed, distance and calories should be enough to keep track of any self imposed fitness goals. The maximum user weight is usually a very good indicator of the durability of a vertical climbing machine. As a rule of thumb any climbing machine with a user weight above 100 kg should be more than adequate for home use. In addition climbing machines that have a high maximum user weight tend to be made from better materials. 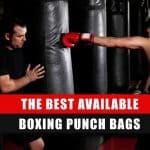 When buying any fitness equipment it’s always good to try to get the best guarantee possible. With vertical climbers the standard is usually twelve months. Anything above a twelve month guarantee is a bonus. Vertical climbers are great for a full body workout. With the added benefit of a cardio workout included this type of fitness machine is a great tool for achieving any fitness goals. Hopefully all the information included in this guide will save you time and money when deciding on what is the best vertical climber for your needs.